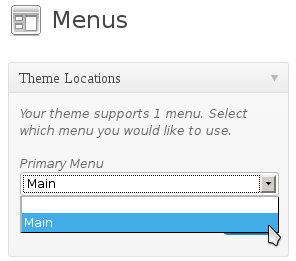 Storm is compatible with the WordPress menu system. To change the navigation, go to Appearance → Menus on the WordPress menu. Create a new menu if you haven’t already, you can call it anything e.g. Main. Once you’ve added the menu, on the top left of the page you will see a box named Theme Locations, select your new menu from the drop down and click Save. When you have added menu items they are draggable, you can drag and drop the order of your main nav and if you require sub pages drag a menu item slightly to the right of it’s parent, this will create a drop down under that main nav item.